Head to Kendal over the weekend of 18th – 19th August and join in with Kendal’s very own celebrations to honour the RAF centenary. The weekend events are hosted by Kendal BID and will include the instalment of a replica spitfire, fantastic competitions, a Parade and of course the RAF inspired summer trail. This is a rare opportunity to see a full size replica spitfire up close. The plane – a one of a kind replica, which took more than 20 years to build using genuine Spitfire parts and original drawings – will be positioned on Kendal’s New Road, on the banks of the River Kent for the weekend. On Sunday 19th August, following a service at Kendal Parish Church at 10:40 am, the Royal Air Force Air Cadets will parade up Highgate and Stricklandgate, past the Town Hall and onto the War Memorial for a wreath laying ceremony. 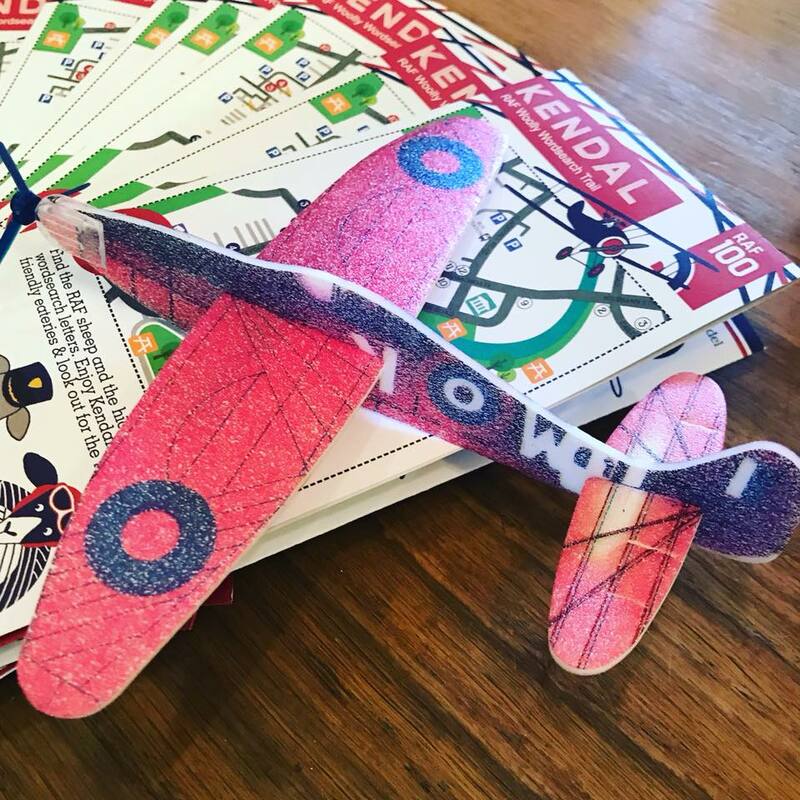 Kendal BID’s summer trails are back for 2018 with a RAF Wooly Wordsearch Trail for the kids and a Beer, Wine and Food Trail for the grown-ups. Running until 21st September, Kendal BID’s RAF campaign will also feature a squadron of Spitfire sculptures, made of wool on eight-foot wire frames. These fantastic installations will reflect the town’s slogan “Wool Is Our Bread”. Designed by artist Stewart Williams, the woollen sculptors will be suspended in the Westmorland Shopping Centre, Blackhall Yard, Wainwright’s Yard, and Elephants Yard over the summer months. Alongside the Wool sculptures, Kendal will be in bloom with a display of blue, red and white flowers and RAF 100 banners designed by Kendal RAF Cadets. So head down to Kendal to see this fantastic display and ponder for a browse in our many fantastic shops and eateries. For a chance to sit in the cockpit of the Spitfire, Kendal BID are running a little competition. There will be two winners under 14 and two winners over 14 and each winner will be given the opportunity to sit in the cockpit of MK805 and have photographs taken to commemorate the moment. To enter the competition head to the Kendal BID Facebook page. The closing date is noon on Friday 17th August so you don’t have long! Good luck!